I retain the copyrights to all my images and paintings. The sale of a painting does not transfer ownership of my copyrights, neither in full nor in part as derivative works. However, I always welcome art licensing opportunities. 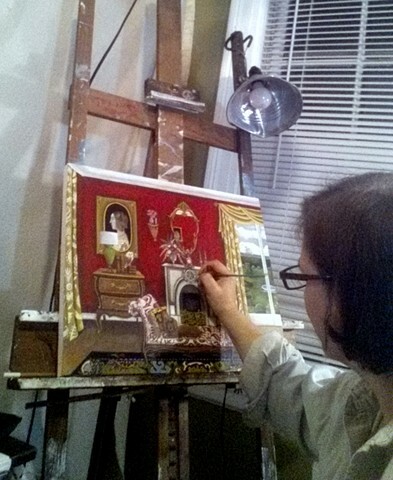 BIO: I am a self-taught painter from the U.S. where I have an in-house studio. I specialize in vibrant interiors still life's-, room portraits and botanical designs. I work in oils as well as acrylics in a variety of sizes from small affordable to large canvases. My subject matter ranges from whimsical animals to interiors scenes with a renaissance influence. I am currently accepting commissions. My work is displayed in private collections throughout North America, Europe, Asia, The Middle East as well as Australia. My paintings have been featured in numerous design publications such as Style Magazine Australia, Artisticmoods, Surrounding Magazine, Wilson Art's, The Statement Blog, Note To Self, and Shelterrific. One of my paintings was selected for the cover of Sasee Magazine. I've also done a commission for a Grammy-winning singer/songwriter. Thanks for looking! Buy Art from the people who make it.